He Do the Police in Different Voices is a website co-created by myself and Julian Brooke in 2011–2012. It was built on work carried out collaboratively with the students and Teaching Assistants of the Fall 2011 section of “The Digital Text,” a course I taught at the University of Toronto from 2011–2013. 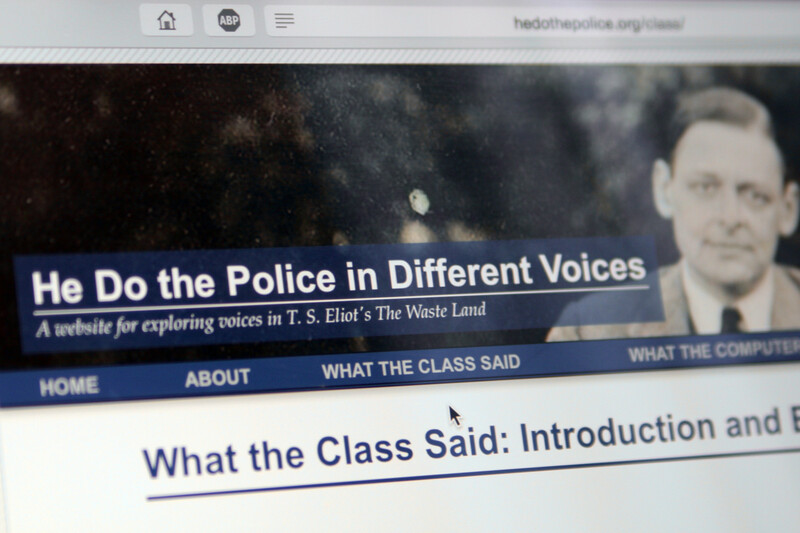 He Do the Police in Different Voices [is] a website for exploring voices in T. S. Eliot’s The Waste Land. This site takes its name from Eliot’s evocative working title for his poem. Following the lead presented by this title, this site is a resource for exploring fundamental questions about The Waste Land: How many voices are there in the poem? How do these voices differ from one another? Where do the voices switch? Do some voices return? Is there an overarching narrator who “does” all these voices, or are they independent of one another? The site is divided into three main sections. The first of these sections, “What the Class Said,” presents the answers to some of these questions as arrived at by the Fall 2011 section of the University of Toronto undergraduate English course, “The Digital Text.”Through a combination of qualitative and quantitative approaches, including polling and TEI encoding, the class settled upon a preliminary hypothesis about how many voices there are in the poem, where they switch, and where they return. This hypothesis is tested using purely quantitative methods in the second section, “What the Computer Said.” This section presents our efforts to develop an algorithm for automatically detecting voice-switches in The Waste Land, and allows visitors to compare what counts as a “voice switch” for a computer and a human. The third section, “Have Your Own Say,” allows you to provide your own reading of the poem’s voices. Here, in a two-step process, you can indicate every place where you believe one voice gives way to another, and then assign a particular identity to each selected chunk of dialogue. Your input in this section is invaluable, and will be incorporated into future research. Julian and I continue to pursue and publish research related to voices in The Waste Land.